Valley View is a great cabin with amazing views and close to the attractions in the area. Cabins USA staff was very nice and easy to work with. The only cons were that the sofa in living room is broke down and needs updating as well as a new mattress, was a little hard. Overall a great experience. would definitely stay there again. Valley view had an amazing view, but the drive up the mountain to the cabin was a little scary. Also, while we were there, the light outside by the hot tub did not work, so we let Cabins USA know, and they put a work order in. When we got back to the cabin, all they did was take the whole light down. Therefore, we were unable to use the hot tub because we couldn’t see anything on that side of the porch. The cabin was very nice on the inside, and perfect for my husband and myself, but we didn’t like how you could see through the window on the front door. Especially since you could see it from in the bedroom. Other than those few things, we had a blast at Valley View! The bed was very comfortable!! This cabin was awesome! So cozy and the view was perfect. We really loved the downstairs pool table and bar area. The hot tub was super clean and comfortable. Loved the jacuzzi tub with the huge window to enjoy the view from. The upstairs shower needs a new shower head and the fireplace needs fixed. We would definitely come back here. The view was amazing, the staff were great, but the cabin wasn't quite what we expected. It looks much better in the pictures. The bed matress should,be replaced as it was so sunk in, I would highly recommend bringing your own pillows if able, the one I used was nothing but clumpy stuffing and so uncomfortable. The hot tub was the best part by far, even though the temperature wouldn't reach 102 (as I'm used to) it was still warm enough to use on the cooler nights, and not too hot during the hot days so I could still enjoy it. The jacuzzi would only fill half way before the hot water ran out, so we had to fill what we could, give it a half hour, and finish filling it to use it; but we managed with the porch swing looking over the mountains. We decided for our 10 year wedding anniversary to go on our first vacation. We have 8 kids so we needed somewhere we could have some relaxing peace for a couple of days. It was a breathtakingly beautiful view. The thing I miss the most is drinking a cup of coffee on the back deck every morning. When we first arrived we was a little nervous because it looked so small but once you go inside it is much larger. Not as private as I expected but private enough. But it is up a rather large mountain side so be prepared in case your there in the winter. LOL! Very clean though and plenty of things in the cabin to cook with. Brought my coffee maker from home but there was already one there. I can’t wait till we can come back. It was a perfect belated honeymoon. We just loved it. Thanks CabinUSA, we highly recommend! Cabin is at a beautiful location with a wonderful view. We saw some amazing sunsets while we were there. Hot tub is nice for relaxing after long hiking days. The few issues we had was the bottoms on the microwave and exhaust van above the stove don't work properly. There were several light bulbs out and there were no pot holders in the kitchen as well as not having much silverware. We has a wonderful, relaxing vacation. This is the third year we have come to Pigeon Forge and stayed with Cabins USA. Different cabin each year and they were all beautiful. Cant wait til next year and We will be staying with them again next year!!!! There was the issue of the cabin not being cleaned when we arrived but the sent someone right out to clean so it wasn’t a big issue!!! The cabin was great and the view was AMAZING!!! We definitely plan on stayin again and bringing out kids with us!! Enjoyed the hot tub and the jacuzzi!!! Definitely recommend!!! The view was wonderful. Loved everything there except the bed. It was too hard. It could use some updating, but overall it was a great first experience renting a cabin. Great place . Coffee pot was very slow . No dish towel and no pot holders was the only problem. Very quiet and beautiful place will come again. Wish it had Wi-Fi. The biggest complaint I would have is the bed. I have used Cabins USA 3 times now and have always been very happy with their service. I love the express check in and check out. It is very convenient. With regard to this cabin most everything was great. We had a nice time. It was just my husband and I so the size was good for us. It was nice that their was 2 bathrooms. The Jacuzzi in the master bedroom was a great feature. It and the hot tub were nice to relax in after a long day sight seeing. A few things that we didn't like - the bed in the only bedroom (the master bedroom) was extremely uncomfortable. It felt like sleeping on the ground. Neither one of us got much sleep in the 3 nights we were their because it was so hard. We even considered sleeping downstairs on the pull out sofa except for the fact that it was way too cold down there. We were here in the winter and we kept the heat on 70 the whole time and the upstairs was comfortable. The downstairs on the other hand was freezing. We played pool a few times and had to keep jackets on while playing because it was too cold not to. If its winter and you plan on somebody sleeping downtairs you better bring lots of extra blankets. One other thing that somebody should fix is the microwave. Some of the buttons don't even work and the ones that do work will do the wrong thing. You push 1 minute and 4 minutes starts. You push 3 and the pizza button starts. We were able to use it but one of us had to stand there the whole time to stop it when we needed it to stop. The road up to the cabin is scary. It is only wide enough for one vehicle at a time. On one side is mountain side and on the other is straight down. If you meet another car be prepared to back down or up a twisty, narrow road because there isn't anywhere to pull off to pass each other. Thank goodness we didnt meet any other cars but we were here in the off season. All in all, we will definelty use your company again but we would not choose to stay in this cabin again. View was the best I've seen in a cabin. Literally WAY on top of the mountain, very secluded. LOVED the hot tub, it was actually hot! You can tell it's an older cabin, as I've stayed in newer ones...it definitely needs some updating, but it was still wonderful. We loved the bar area downstairs, and the pool table. We were so impressed with the coziness and yet large size of the cabin. The location was beautiful, overlooking the snow covered mountains. It was everything we wanted and more. The only issue we had was that the hot tub area light would not work and we couldn't get anyone to fix it. Over all, we were very satisfied with the whole experience and will definitely be back. Had two small issues when we got there, but they were there first thing in the morning. Rick did a great job. The view was great, not real happy with the road leading to cabin. The cabin itself was beautiful. Could use some minor repairs... Upstairs bathroom faucet...light bulbs replaced. Had no light in the shower. Some lights out in other areas. Bed needs a new mattress. Carpet is in need of a deep cleaning. Other than that, it was perfect. View is beautiful. Would stay again. awesome cabin but the road to it wow needs work. Needs a new mattress. Fix upstairs bathroom sink faucet. Drain out the hot tub. It's a beautiful cabin. Amazing view!! A few updates could really improve feedback. Thank you for taking the time to let us know about your recent stay in Valley View! We here at Cabins USA strive to give each of our guests the same great stay you enjoyed while vacationing in the Smokies. Thank you for letting us know about the mattress and sink faucet. Your comments have been forwarded to our maintenance department to be addressed. When you are ready to stay with us again, please mention you are a return guest for an additional discount. Thank you for choosing Cabins USA and we look forward to seeing you again soon! it's very good cabin, a great and perfect view, and we saw the bear front of the door he was so nice , also that not first time for the visited the smoky mountains (USA Cabins)and that not the last time, We will come back again soon . Thank you for taking the time to let us know about your recent stay in Valley View! We here at Cabins USA strive to give each guest the best stay possible while vacationing in the Smokies. When you are ready to stay with us again, please mention you are a return guest for an additional discount. Thank you for choosing Cabins USA and we look forward to seeing you again soon! We loved the cabin and the view but the washer and dryer were not working properly. The microwave had a mind of its own. We had now dish soap to was dishes by had or to wash down the table or counters with. The rd up the hill to the cabin was overgrown in most places. Other than that the cabin was great. Great property. Private, beautiful view,,great hot tub. Could use some cooking utensils, frying pans, but other than that, had a wonderful time. Would recommend. My husband and I stayed at valley view. We absolutely love the cabin. Other than a few things wrong it was great. Some light bulbs were blown, Jacuzzi didn't work recliners didn't recline microwave was whacky and door lock gave us problems. We did have maintenance up to fix the door lock and then it worked great. We could have had them up to replace bulbs but decided not to. I actually got home and started looking for next year's cabin. Thank you for taking the time to let us know about your recent stay in valley View! We here at Cabins USA strive to give each of our guests the best stay possible while vacationing in the Smokies. I apologize for the issues you experienced during your stay. Your comments have been forwarded to our maintenance department to be addressed. When you are ready to stay with us again, please mention you are a return guest for an additional discount. Thank you again for your review and thank you for choosing Cabins USA! The cabin was nice, but it needs some major upgrades. The hot tub didn't get as hot as it should have. The outside light over the hot tub wasn't working, we bought a bulb thinking it had blown and still didn't work. The recliners in the living room were broke, didn't work. The toilet leaks water when you lean back on it. The tv system needs an upgrade. There was no instructions on how to turn it on, it was really complicated. Too many remotes around as well. These issues will need fixed sooner than later. Besides that it was a nice cabin, we enjoyed our time playing pool and using the hot tub. The drive up the road was pretty sketchy, not many signs, no guard rails, no lights, wasn't the safest. We were not sure if it was a one way or two way road, we called the office to ask them, we left a message and I emailed and we never received anything back, this was after calling 3 times to no answer, the office was still open during this time. I didn't appreciate that, but check in and check out went smooth. The cabin was very clean, and we had a nice time. I will recommend it to anyone who ask, if we ever come back we will go through Cabins USA again, thank you! This was a first cabin stay for us and it did not disappoint. The view was exceptional and there is a lot to do and see in the area. I would definitely recommend this stay. Thank you for all of your kind words! When you are ready to stay with us again, please mention you are a return guest for an additional discount. Thank you again for your review and thank you for choosing Cabins USA. Valley View was just what we were looking for. The minute we walked in it just felt like home, very cozy and comforting. My wife does not like most mountain roads but was very comfortable with the ease and location. the view in the mornings at sunrise and sunset we just what we wanted. 2. we were only able to watch one show at a time as the TV's (3) would not operate independently. overall we are very satisfied!! I am so happy to hear you enjoyed your stay in Valley View! We here at Cabins USA work hard to make sure each of our guests have the best stay possible while vacationing in the Smokies. Thank you for your suggestions. Your comments have been forwarded to our Owner Liaisons and they will be bringing those to the owner's attention. When you are ready to stay with us again, please mention you are a return guest for an additional discount. Thank you again for your review and thank you for choosing Cabins USA! Amazing from start to finish!! The booking and check out was a simple phone call. The view was incredible. The cabin it's self is beautiful. Our only complaint was the hot tub outside had sand in it, but otherwise everything else was very clean. We will definitely book through Cabins USA next time we head south. Thank you so much. I am so happy to hear that you enjoyed your stay in Valley View! We here at Cabins USA work hard to make sure each of our guests have the same great stay you enjoyed while vacationing in the Smokies. When you are ready to stay with us again, please mention you are a return guest for an additional discount. Thank you again for your review and thank you for choosing Cabins USA! It had a great layout and was very cozy. I loved the location and was so glad everything worked. I have stayed with other cabin companies and paid a lot more for cabins where the amenities didn't even work. What a pleasant surprise to find this little gem. Will definitely be back! Thank you for all of your kind words! We here at Cabins USA work hard to ensure each of our guests have the best stay possible while vacationing in the Smokies. When you are ready to stay with us again, please mention you are a return guest for an additional discount. Thank you again for your review and thank you for choosing Cabins USA! We got married last year and honeymooned in Gatlinburg, we called Valley View home for a week. The view is impeccable and it's cozy home feel is what brought us back to the exact cabin a year later to celebrate our one year wedding anniversary. Waking up each morning, going out on the back deck to enjoy coffee and a view of the mountains we so heartfelt love is what makes this little cabin a forever home away from home. We actually plan to come back to the same cabin once again this summer with my mother to give her a view of the mountains she has never seen before, and won't soon forget. And of course, we will be back each January to celebrate anniversaries to come. The only downside about this trip was that the trash was not taken from the previous guests and when we first arrived at the cabin we found the trash can knocked over from the wind, and trash scattered all over the deck. We picked it up, no big deal and called customer service to ask them if they could pick it up and they said they would send someone out to get it. Our entire stay, as short as it was, the trash was never picked up and the wind had gotten the can again, leaving trash all over the deck. We just left it that way. But other than that small detail, my husband and I would highly recommend booking with Cabins USA and staying at Valley View if you're looking for a true mountain experience. I am so happy to hear that you enjoyed your stay in Valley View! We here at Cabins USA work hard to make sure each of our guests have the best stay possible when vacationing in the Smokies. Thank you again for your review and thank you for choosing Cabins USA! The location of the property was wonderful. We loved how secluded it was and the house was very nice. The only thing I would change was the furnishings. The couches and bed were very uncomfortable and the furnishings were outdated. I will give it a 10. But a few little things could be done had a power issue with lights downstairs and in bedroom bath area. Needs new batteries in remotes wouldn't hurt to update 2 of the tvs to flatscreen living room tv had a beautiful picture. Toilet downstairs was a little wobbly also pool table green was damaged and was afraid to use it Jacuzzi tub inside barley put out any jet pressure knob was froze up to adjust it Outside hot tub was fantastik Bed was a little uncomfortable an adjustable bed would be nice Considering when we stayed despite the smoke we would stay again hopefully for our anniversary. All of the staff was super nice and helpful. Cabin was very nice great view and easy to find. The only upgrade it needs is television in bedroom is very poor sound and picture was bad. Everything else was great at the cabin. Thank you for taking the time to let us know about your recent stay in Valley View! We here at Cabins USA work hard to make sure each of our guests have the same great stay you enjoyed while vacationing in the Smokies. Thank you for letting us know about the television. Your comments have been forwarded to our maintenance department to be addressed. When you are ready to stay with us again, please mention you are a return guest for an additional discount. Thank you again for your review and thank you for choosing Cabins USA! My wife and I were extremely pleased with everything about our experience with Cabins USA and the Valley View cabin itself. We had been going back and forth on where to go for our honeymoon. We had got it down between the beach and the mountains. I'm more than sure that we made the right decision. The staff was great the cabin was great and you'd never get the views we had at the beach. We will definitely be using Cabins USA again for our next trip to Pigeon Forge. Great view from the cabin & loved the privacy! There were several issues though.... The cabin was not clean upon arrival, the fireplace does not work, the dishwasher leaks, we did not have a lid for the trash can therefore a raccoon kept getting in it, the bed was extremely uncomfortable & the leather couch is broken. If the view wasn't so amazing, we wouldn't have stayed at this location but would still book our stay with cabins USA! We were very pleased with our stay. Everything was beautiful and relaxing just as pictured. We would love to come back and definitely use CabinsUSA. Thank you for accommodating one night stays and making checkin/out super easy. We stayed entertained with onsite amenities. Negatives: the cabin had a bad smell initially. Thankfully I had air freshener and we opened doors to air it out and all was fine in a couple of hours. I've seen reviews stating mattress was firm. NO the mattress needs to be replaced. It took a long time to go to sleep as a result. Also, we were given a security code but there wasn't a security system....confusing! Lastly, like many stated the drive up was SUPER scary. If another car would have been traveling in opposite direction as us an accident could have easily happened and there are no guard rails preventing drop off. Thank God for your traveling mercy! All in All we keep talking about how much we enjoyed ourselves and hope it's available on our next trip or can find one equally nice. Again, Thank You! Thank you for taking the time to let us know about your recent stay in Valley View! We here at Cabins USA work hard to make sure each of our guests have the best stay possible while vacationing in the Smokies. Thank you for letting us know about the mattress in the cabin. Your comments have been forwarded to our Owner Liaisons and they will be bringing this to the owner's attention. When you are ready to stay with us again, please mention you are a return guest for an additional discount. Thank you for choosing Cabins USA and we look forward to having you as our guest again! We really enjoyed our stay! The view from the cabin was absolutely stunning! We really liked that the cabin was so cozy and it was really easy to get to. We had no trouble at all with the road, although we did not travel it at night. On our first night there we had a visitor, a raccoon came right on to the deck and looked through the window at us. We can't wait to stay again with Cabins USA! Everything was great. The jacuzzi tub wasn't able to get full and microwave didn't work,but the view and the beautiful cabinmade up for it. We had a great time. Thank you for taking the time to let us know about your recent stay in Valley View! We here at Cabins USA work hard to make sure each of our guests have the best stay possible when visiting the Smokies. Thank you for letting us know about the jacuzzi and microwave. Maintenance has been notified and will be correcting those issues. When you are ready to stay with us again, please mention you are a return guest for an additional discount. Thank you for choosing Cabins USA and we look forward to having you as our guest again! This was our 4th stay with Cabins USA and our 4th Cabin and as usual we were absolutely not disappointed. Actually getting ready to book the next trip already. The cabin was exactly as the pictures show, views were beautiful and absolutely loved and appreciated our seclusion and privacy. We both became emotional at the end of our week when we had to leave, if it wouldn't have already been rented we probably would of stayed yet another night...never wanted to leave. Thank you Cabins USA for another wonderful vacation - love being able to trust there will never be any hassles or issues when we rent from you. Thank you for all of your kind words and for continually choosing Cabins USA when you visit the Smokies! We work hard to make sure each of our guests have the same great stay you enjoyed. Thank you again for choosing Cabins USA and we look forward to seeing you again soon! Absolutely loved our stay at this cabin! Couldn't have asked for a better view! The cabin itself was so comfortable and felt like being at home. Will definitely be making a return trip. The only issue we had was the scariness of driving up the narrow, winding mountain road to get to the cabin. Just prayed we never met another vehicle and fortunately we did not. We did have the pleasure of having 7-8 turkeys practically on our front porch the first night. All in all was a spectacular vacation! Thank you Cabins USA! We enjoyed our stay in Valley View. We loved the view but getting to the cabin was tricky. We liked the fact the cabin was secluded. The bed was a little hard but that's just me. We had a visitor one night from a hungry raccoon, he tore into the garbage can. Thank you for taking the time to let us know about your recent stay in Valley View! We here at Cabins USA work hard to make sure each of our guests have the same great stay you enjoyed while vacationing in the Smokies. When you are ready to stay with us again, please mention you are a return guest for an additional discount. Thank you again for your review and thank you for choosing Cabins USA! Few light bulbs burnt out. Faucet on lower level would not stop running cold water. Loved the cabin. Hope to visit it again. The cabin was more than my husband and I expected. It was absolutely beautiful and then some! 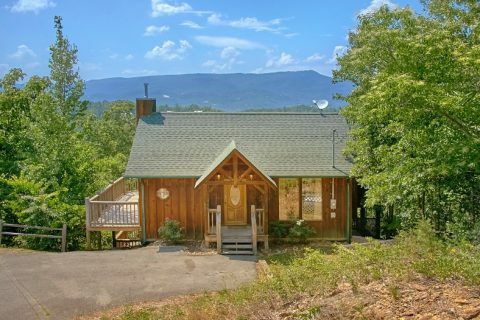 If you are looking for a cabin that is totally in the mountains and on top of one, then this is the cabin for you. It had the most amazing site from the back porch that was breath taking. The cabin inside was gorgeous, clean and very spacious. We unfortunately got there after it had gotten dark and we did have a hard time finding the cabin going up and down dark, very dark mountain roads out there. There are no lights at all except your car lights, so it took us awhile to find it in the dark. It was a bit scary going up and down the mountain roads whether it was dark or daylight, but we got through it. I would just recommend not trying to find any cabin in the dark............lol........but all in all, it is the perfect cabin to stay in and we hope to stay in it again ourselves in the future. Thank you for all of your kind words! We here at Cabins USA work hard to make sure that each of our guests have the same great stay you and your husband enjoyed while vacationing in the Smokies. When you are ready to stay with us again, please mention you are a return guest for an additional discount. Thank you again for your review and thank you for choosing Cabins USA! the bed is very firm didn't do my back very well some people might like it but we didn't the furniture needs to be replaced,the drive up to the cabin is a little scary needs to have grad rails up if you would slide there's nothing stopping you. even with somethings needing attention we still had a great vacation.We will rent with Cabin USA again,Thanks! The pictures don't do it justice. It was fabulous and we enjoyed it so much!!! Thank you for all of your kind words! We here at Cabins USA work hard to make sure each of our guests have the same great stay you experienced while vacationing in the Smokies. When you're ready to stay with us again, please mention you are a return guest for an additional discount. Thank you again for your review and thank you for choosing Cabins USA! Loved this cozy get away! The only thing I would recommend is getting better trash cans outside that are raccoon proof. It was kind of a bummer having to clean garbage off the deck in the morning. Also the bed is very firm,which may not be an issue for some people but I didn't like it. Overall though, the place is amazing and the morning view of the mountains is spectacular. We will definitely use cabins USA again! Thank you so much for all of your kind words and I am so happy to hear that you enjoyed your stay in Valley View! We here at Cabins USA work hard to make sure that each of our guests have the same great stay you enjoyed while vacationing in the Smokies. Thank you for letting us know about the garbage cans. Your comments have been forwarded on to our Owner Liaisons and they will be bringing those to the owner's attention. Thank you again for your review and thank you for choosing Cabins USA! This was our first trip to the mountains but definitely not the last. This cabin offered spectacular views of the surrounding mountains. 5 minutes to Pigeon Forge and 20 minutes to Gatlinburg. Pros: great location, very roomy for 2 people, both decks offered stunning views of the mountains, close to everything in town, big hot tub and jacuzzi tub. Very clean and well kept. Kitchen well stocked with utensils but we did bring a bigger frying pan which was needed as they only had small ones. Always had plenty of hot water, central air was nice to have. 2 complete bathrooms was nice but just used one. Washer/dryer was convenient, washed our clothes before leaving. Online check-in and checkout was a nice feature, did not have to stop at the office to check in or out. Cons: could not get ceiling fans in bedroom or downstairs to operate, window screens would have been nice. Would liked to have opened windows for the air circulation but with no screens bugs could get in. Upstairs carpet stained-complete hardwood floors would be better. Terrible water pressure-not certain if this is related to being in the mountains. Took forever to fill the big jacuzzi. One nice surprise was the little black bear cub that came to visit our first day there. He wandered around on the deck for awhile and we got some great pictures. He seemed really friendly, he didn't run away when I went out but I didn't get too close. Wasn't sure where mamma was. We were disappointed that he didn't come back again. We will definitely be back to the mountains! Thank you for taking the time to let us know about your recent stay and I am so happy to hear that you enjoyed Valley View and were even able to see some of the local wildlife! Our express check-in and text to check out features are a great way for our guests to make the most of their trips to the Smokies. Thank you for letting us know about the ceiling fans and lack of window screens. These have been forwarded on to our maintenance department so they can be corrected. When you are ready to stay with us again, please let our reservationists know you are a return guest for an additional discount. Thank you again for your review and thank you for choosing Cabins USA! Valley View was everything and more! The process was painless and fast! They had everything ready when k checked in. Our first time in a cabin, and we will for sure be back to Valley View through CabinsUSA! Very friendly, and you text to check out and I loved that it was actually someone texting back and not a standard automated service. The location was easy to find and absolutely beautiful! Even one bedroom was very spacious. We really enjoyed it and recommend it to everyone! We'll be back next year! Hopefully Valley View will be available! Thank you for all of your kind words! We here at Cabins USA work hard to make sure that each of our guests have the same great stay you enjoyed while vacationing in the Smokies. Our express check-in and text to check-out features are time saving ways for our guests to get the most out of their stays. When you are ready to stay with us again, please let our reservationists know you are a return guest for an additional discount. Thank you again for your review and we look forward to having you as our guests again! We first had trouble finding the cabin, as the sign was extremly hard to read. Once found, we thought this was very beautiful. The View was amazing. Coffee Table and sofa were not sturdy, so it was not very comfortable to sit, nor did it recline like it should. The Bed was comfortable however it felt like everytime you sat on it that it would break. There were dead bugs in window ledges that could have been cleaned up prior to our arrival. Also would have been nice to have a DVD/Blue Ray player in the living room as we brought movies to watch but couldn't. However w/ the minor things we encountered we had an amazing time and enjoyed being able to sit and relax w/ no outside worries. Even though it seems like I have a lot of complaints above, we trully were happy with our stay. We enjoyed our stay it was for our 25th Anniversary. It was sobvery nice and beautiful view! !! Thank you for choosing Cabins USA to celebrate your anniversary! We work hard to make sure that each of our guests have the same wonderful time you enjoyed while vacationing in the Smokies. When you are ready to stay with us again, please let our reservationists know you are a return guest for an additional discount. Thank you again for choosing Cabins USA and we look forward to seeing you again soon! Beautiful cabin but would probably be very hard to get to in the winter because of the long, narrow road leading up to it. I loved most everything about it. My only complaints would be there is no alarm system. I was given the code to disarm the alarm and searched for like 20 minutes for it and never found one. I called in to ask and the staff member didn't know either. The satellite system is not very good either. You can only control the main TV in the living room and you have to watch whatever is playing in the living room on all the other tvs. The mattress on the bed is very firm, so if you like that it would be ok, but I prefer a softer bed. Other than those things, it was a very nice, clean cabin. Thank you for taking the time to let us know about your stay in Valley View! I apologize for the confusion about the alarm system. Your review has been forwarded on to our owner liaisons and they will make sure that issue is corrected. We appreciate each of our guest's feedback as that helps us improve our service. When you decide to stay with us again, please let our reservationists know you are a return guest for an additional discount. Thank you again for your review and thank you for choosing Cabins USA! Thank you for all of your kind words and I am happy to hear that you enjoyed your stay in Valley View! Thank you for your suggestion about adding WiFi to the cabin. I will pass that on to our owner liaisons and they will speak with the owner to see if that is a possibility. Thank you again for your review and thank you for choosing Cabins USA! quietness & the beautyness! ! We couldn't have been at a more *romantic* place for a 35th anniversary trip!! We loved the hot tub & just everything!! Thanks for having us. The narrow lane up to the cabin was a little scary but we made out. 😉 Loved it!! I am so happy to hear that you enjoyed your stay in Valley View! We strive to give each of our guests the same wonderful experience you had. Please feel free to contact one of our reservationists when you're ready to start planning your next trip to the Smokies. Thank you for choosing Cabins USA and we look forward to having you as our guest again! My husband and I chose this cabin for a weekend getaway and we were not disappointed. We loved the view & the rec room. The jacuzzi tub and a few other things weren't working on our first night but we were pleased when we called for maintenance & they came right out the next morning and fixed everything. There were a few dead bugs on the ledge by the jacuzzi tub in the master but other than that the cabin was fairly clean. We would definitely stay there again. If you want some good pizza as well, Geppetto's on down Wears Valley was awesome! It would be nice the TV were upgraded and there was more than one cable box. Also, would love to have coffe provided. And lastly, make sure all the light bulbs are working. Thank you for your review. We appreciate your feedback on your stay with us. We apologize for any inconvenience you may have encountered during your stay. All the light bulbs will be checked immediately. Again, we appreciate your time, and we hope that we will hear from you again soon. My husband and I spent our 3rd anniversary in Valley View and it was more than expected. The view was like A dream. We Couldnt Have Asked For Anything More Perfect Than Our Week In This Wonderful Cabin. We Have Decided To Return Every Year Form This Year On. The cabin was perfect for our weekend stay. con-the owners should invest in more pots/pans and kitchen utensils. We cooked the whole weekend and there wasn't much in the kitchen as far supplies go. The mousetraps were placed in visible areas which isn't appealing to guests. we spend several weekends a year in Pigeon Forge and this is the first cabin we've stayed in with visible mousetraps. Great location and beautiful view! We loved our stay at Valley View! We were so impressed with our cabin and everything it had to offer. We weren't informed since we were locals that there would be a $200 refundable deposit so that hampered quiet a bit of our plans since we work in the area and very rarely get vacations let alone my husband and I because we also have 2 beautiful children so weekend escapes are a blessing but the nice woman up front spoke with her manager and they took off $100 but that's all they could do. We agreed to pay it and we we're thankful but if we would have known we could have planned other activities. V.V was very clean and beautiful except I kept noticing some strange smell from the kitchen. It turned out to be a deceased mouse, and the comfort was A+ except for how uncomfortable the bed was. I had trouble getting up and moving the next day and I'm 24 lol but everything in and around the cabin exceeded our expectations, we had an amazing weekend alone and we were so happy with everything else that we will still recommend Cabins USA to all our friends and family. Thank you for asking about our wonderful stay and we hope you and your team are well.